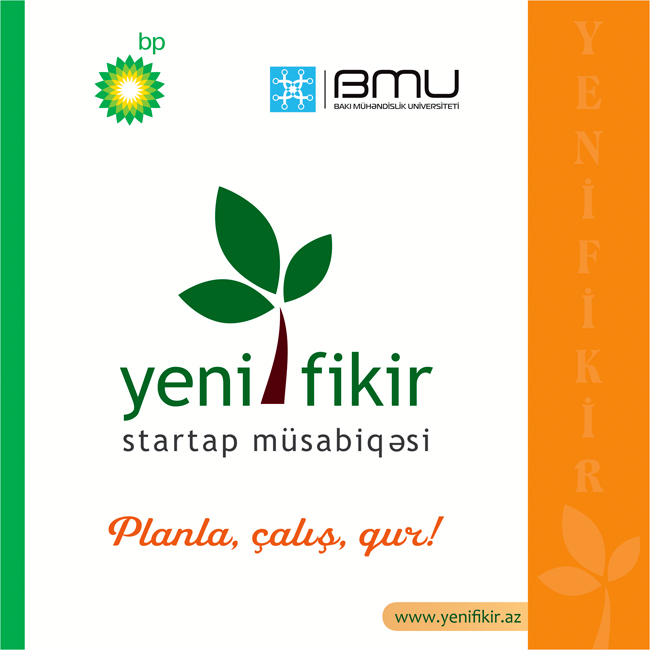 Baku Engineering University (BEU) which plays a special role in the development of innovation ecosystems in Azerbaijan, including startups starts to cooperate with BP in this area.Thus, the "New Idea VI" startup competition is held within the organizational support of BEU and BP's financial support. Not only Baku Engineering University members but also evveryone living in the Republic of Azerbaijan can take part or participate in this competition. The "New Idea" startup competition (NIC) is a project that promotes and supports the development of innovative entrepreneurship (entrepreneurship, startups or technology). So far, the NIC has applied for 5 times to 842 startup projects (including NIC 2013 87, NIC 2014 212, NIC 2015 to 196, NIC 201 to 2016, and 148 startup projects to NIC 2017). More than 100 of them have been directly supported. Development of 35 project was supported by seed investment and incubation services with the support of sponsors and partners. The "New Idea" startup competition is currently being held for the 6th time. "New Idea VI" is sponsored by BP. BP is committed to promoting the competition and contributing to the development of innovation ecosystems, as well as the development of innovative entrepreneurship, which is one of the most urgent issues of reforms in Azerbaijan. The "New Idea VI" startup competition sponsored by BP and contributes to the introduction of new startups to the ecosystem as opposed to previous competitions. Thus, the training and mentoring programs that will be provided with dedicated financial support will help to strengthen the existing startups and create new startup projects. The introduction of startup projects in the startup projects' registration phase and the introduction of new startup projects on the market with training and mentoring services by leading ecosystem specialists is supported. The registration process of the projects is being done on yenifikir.az website. The main criterias for project registration are the innovation, business strategy and compliance of the project team with the assertion of the claimed idea. Evaluation of registered startup projects done at the next stage. Criterias taken in the valuation process are met in accordance with the requirements that set out in the project registration process. According to the results of the preliminary assessment, semi-finalists are determined. Strengthening and developing of the semi-finalist of the project teams done in the semi-final preparatory process. This process takes place in the presentation of leading experts of ecosystem with training and mentoring services.In addition to general training, each project team reinforces mentoring services. The finalists are selected from the semi-final teams. This process takes place in front of the semi-finalists' jury. Finalists of the finals will be strengthened by specifically selected training and mentoring services in the final stage of the training. In addition to preparing the project for the real market, steps are taken to attract investors' attention, as well. The most promising 5 startup teams in the final round are selected and announced as winners. The most promising startup projects are offered to investors and public. Projects that have been won continue to the project based on incubation or acceleration programs. The process of incubation or acceleration is expected to be provided at the Baku Engineering University Technopark and the INNOLAND Incubation and Acceleration Center. Meanwhile, the necessary points for the company's projects are supported by BP's financial capabilities. The contest and various points of the project, as well as its rules continuously updated on the yenifikir.az website, as well as on the Official "facebook" page. Startup competition "New Idea VI" will take place within 7 months. The project manager is the head of the BEU Technopark, dosent Isa Gasimov. Given that large-scale reforms have been undertaken in Azerbaijan for the development of innovation ecosystems, including startup ecosystems, it is ecpected that support from the public and private sectors might be involved in the competition. The competition is being implemented in Azerbaijani language. All ideas are protected as ownership of the individual (or individuals).